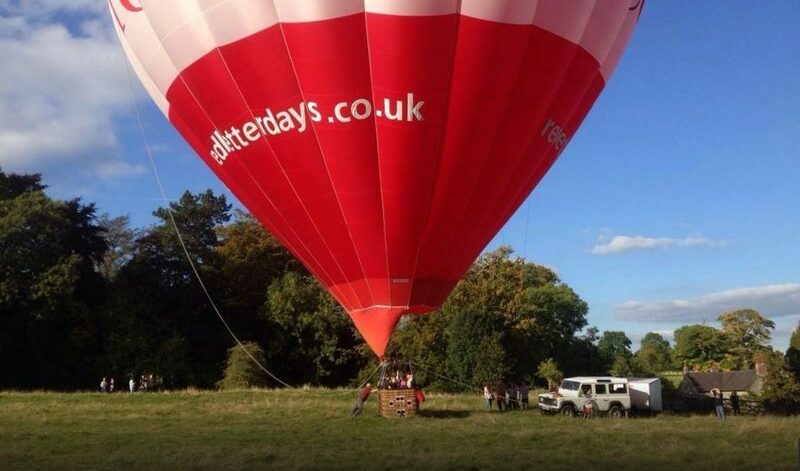 Our little 2 passenger balloon - how romantic! 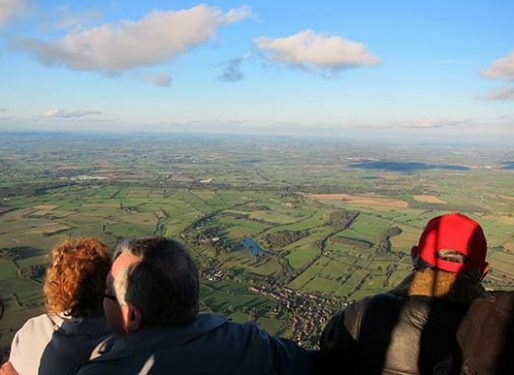 Flying from our Crocky Trail launch site close to Chester allows us spectacular views not only of the Roman city itself, but also the distant hills and mountains of north Wales. Looking towards the north-west you will see the Irish Sea and the River Dee. Of course, to the north is the Wirral, the Mersey and Liverpool itself – where we can usually pick out the landmarks of the Cathedrals, Albert Dock and the Liver Building. Travelling time by car from either Manchester or Liverpool is rarely more than 45 minutes. Even Anglesey is only 90 minutes away! 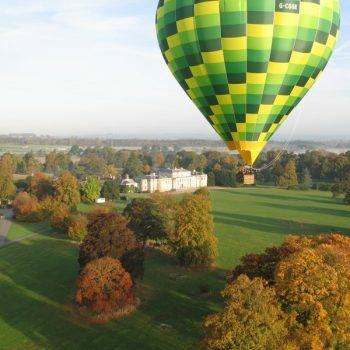 As with all of our venues, flights can be scheduled throughout the year, on weekdays, weekends and even Bank Holidays. 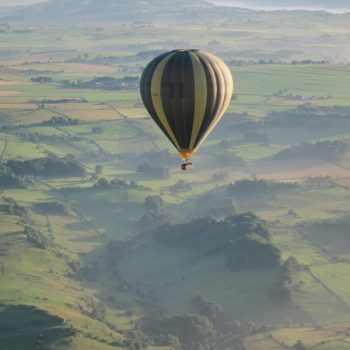 We travel with the breeze, and part of the excitement of going ballooning, is not knowing where the wind will take us! It’s a great little adventure! Typically, we’ll travel anywhere between five and twenty miles during the flight. Of course, as we fly along, our ground crew pursue us by road, whilst in radio contact with the pilot. After landing, all passengers are returned by road to the launch site, where flight certificates are presented by the pilot! 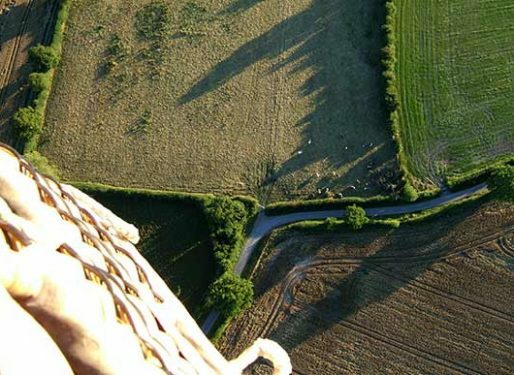 Ballooning is a weather-dependent activity, but don’t worry if your flight is postponed due to unsuitable conditions – you simply reschedule your flight for another date. 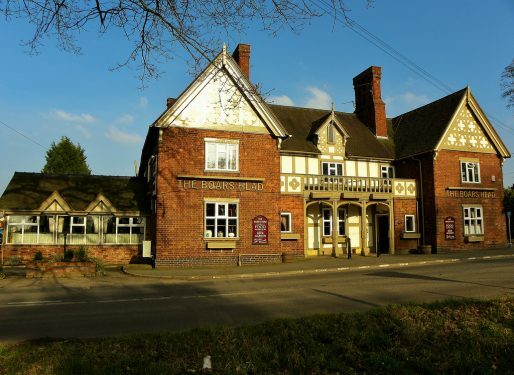 Moving a little further inland, our second Cheshire launch site is just south of Nantwich at The Boar’s Head public house. 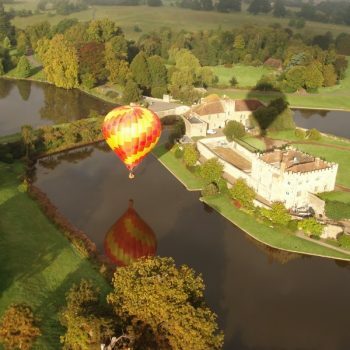 This is a fantastic venue where you can enjoy a drink and a meal before setting off on your hot air balloon flight! 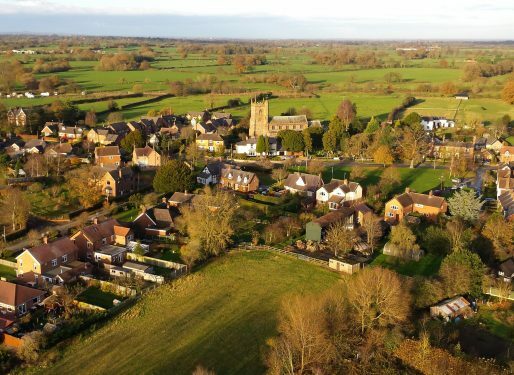 Flying over this region of Cheshire, you will really appreciate the county’s rural heritage, whether in its hundreds of dairy farms or its beautiful half-timbered market towns such as Nantwich. 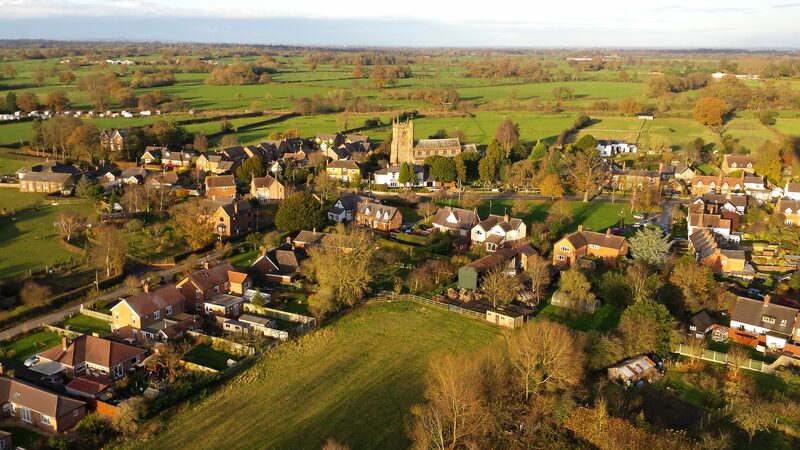 This launch site is just ten minutes from the M6, and within easy reach of Nantwich, Crewe and popular attractions such as Bridgemere Garden World and Audlem village. Packed up - with help from the farmer's kids! Our reflection in the river as we fly over! 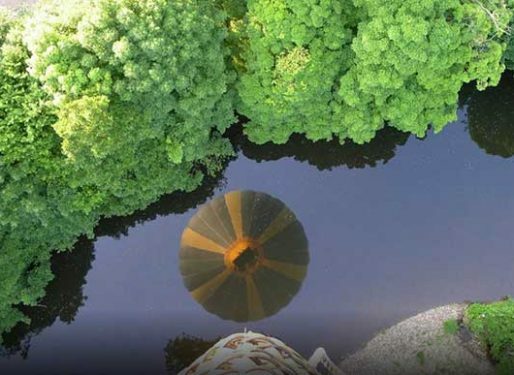 Looking straight down from about 500ft! Alderford Lake, Our Whitchurch Launch Site! 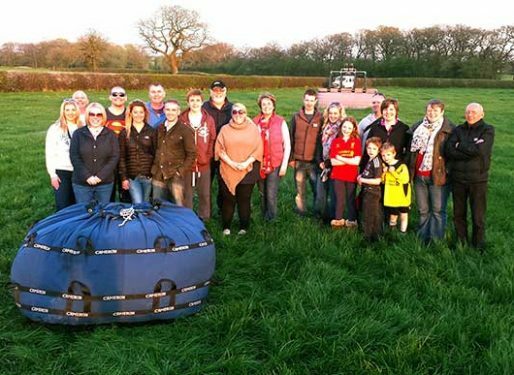 Finally, and just across the border into Shropshire, we have our launch site close to Whitchurch. 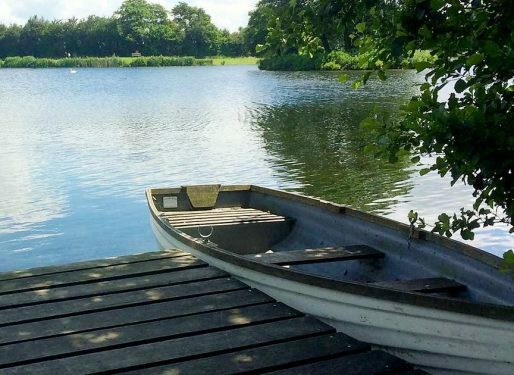 Located just to the south of the town, and well sign-posted from the main roads, Alderford Lake is a beautiful private venue close to the A41 Whitchurch by-pass. 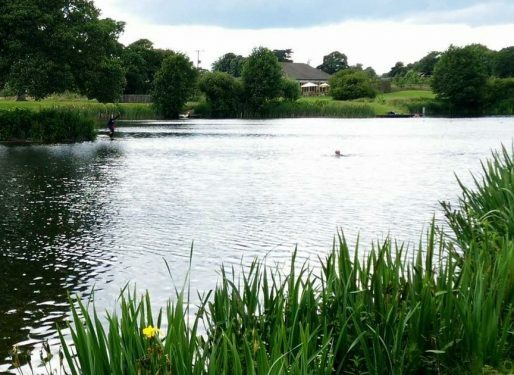 Launching from the lakeside, this is a stunning location that also offers facilities such as refreshments and loos! It makes a relaxing spot for those friends or family who may not be flying or following the balloons. Whitchurch, as Nantwich, is an ancient market town, and as such is well connected to the surrounding areas by an established road network. This makes navigation a simple task, whether travelling from Chester to the north, Shrewsbury to the south, or even Wrexham and Wales to the west. The venue we fly from on any given day is determined by the wind direction, and deciding which of our launch sites will give us the best flight. 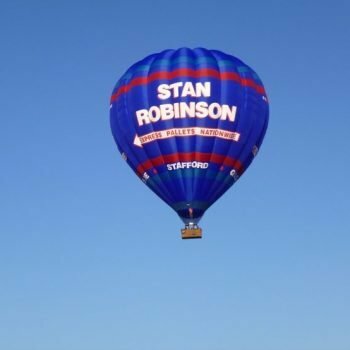 Balloons cannot be steered! Consequently, passengers need to attend whichever of these venues that we determine to use – please click the button below for more details. 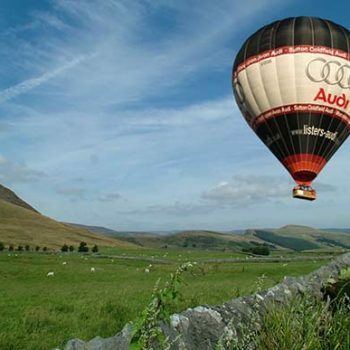 Did you know that hot air balloons cannot be steered at all? They simply float along with the breeze, and go wherever the wind takes them. 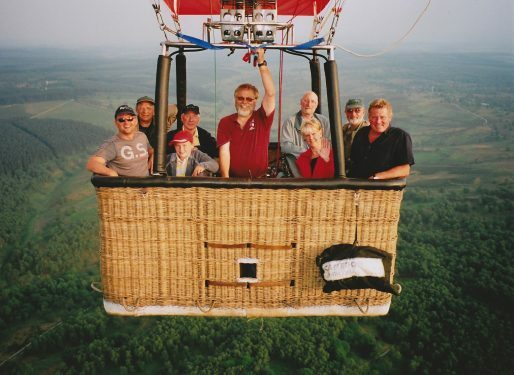 That’s one of the great attractions of going on a balloon flight; every trip is a different and unique adventure – for pilot as well as passengers! We might land anywhere within a 25 miles radius of our take off spot. 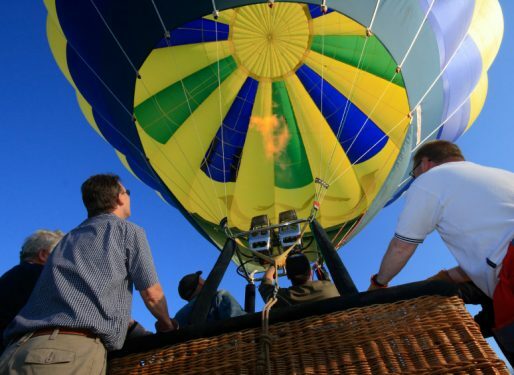 Of course, we can control the balloon in an “up and down” fashion – it’s just the “left and right” that we cannot master! So don’t worry, we won’t come down haphazardly in the middle of a bog, because we just keep on flying until we reach a suitable landing spot. However, we do have to plan ahead and make sure that we don’t risk drifting into controlled airspace, close to the coast or into high ground. Consequently, prior to each flight we assess the wind direction and choose whichever launch site will give us the best flight. When passengers call to check the weather, we tell them which launch site to attend.